Such were descriptions of conduct highlighted by seven Missouri State Senators in a nine-page report that detailed results of a legislative investigation into Planned Parenthood’s practices. Led by Sen. Kurt Schaefer, the Sanctity of Life Committee’s scathing assessment of Planned Parenthood and its lack of cooperation and transparency left unanswered questions about whether aborted baby remains were illegally sold, but nevertheless revealed violations of the law related to the disposal of such remains. The report revealed “stonewalling” by Planned Parenthood, the pathologist who examined the remains, and “top officials in Gov. Nixon’s Department of Health and Senior Services” that forced the Committee to threaten to hold parties in contempt to obtain even minimal cooperation. The report was critical of investigation results released by the Attorney General that suspiciously omitted serious discrepancies to make it appear Planned Parenthood had engaged in no wrongdoing. In the end, enough documents were finally produced for the Committee to conclude that laws were likely broken in relation to the disposal of human fetal remains. “Alarming gaps” existed in the records that raised red flags about the competency of the pathologist and the practices of Planned Parenthood that place the lives of women in danger. For example, in four pathology reports, there were “no identifiable remains” for abortions at 9-20 weeks gestation. There is no record of what happened to the remains, and no indication that the women involved with those abortions were ever alerted to the possibility they may have suffered incomplete abortions, a potentially serious abortion complication. This level of callous disregard by PPSLR for the safety of women seeking their services in an apparent effort to protect their own business model from being damaged by news of “botched abortions” and patients ending up in the ER is shocking. This kind of deliberate organizational effort to steer patients away from emergency medical treatment may very well constitute medical malpractice and reckless endangerment of the health of patients. Written instructions to Planned Parenthood staff members direct them to request that ambulances use “no sirens” when responding to medical emergencies. This can delay care in critical situations where every moment counts. Employees are also instructed to only give very general information to 911 dispatchers, and never mention whether a complication is abortion-related. Staff is also told to keep EMS out of the procedure room (unless necessary). These instructions prevent full information about a patient’s condition from reaching EMS responders and could further delay emergency care. Employees are trained to use a physical banner to shield block the view of patients being loaded into ambulances from pro-life picketers. All of this indicated that Planned Parenthood is far more worried about their reputation, business model, and public relations efforts than they are about the women in their care. It is difficult to conceive of any other organization, let alone an organization that holds itself out as providing women’s health services, being so recklessly indifferent to the health of their patients as to put such directives as those listed above in print for the use of their employees. Operation Rescue was forced to sue the St. Louis Fire Department to obtain information about medical emergencies at the Planned Parenthood abortion facility. Documents finally released by the St. Louis Fire Department show 58 serious medical emergencies, including hemorrhaging and seizures. 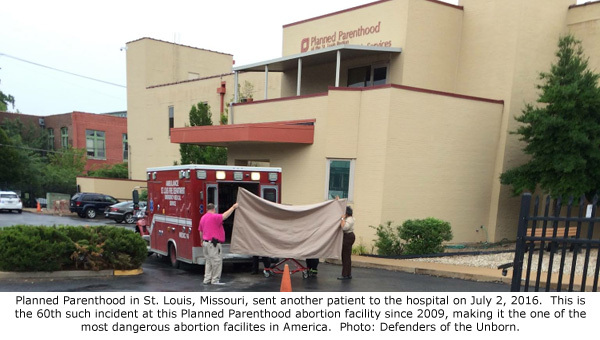 The most recent emergency – the 60th such incident since 2009 — took place at the St. Louis Planned Parenthood on July 2, 2016. Photographs provided Operation Rescue by local activists show staff complying with the order to deploy a barrier to block protesters from photographing the incident. Concealing injuries and out-of-court settlements to women suffering abortion-related injuries “may very well point to a business calculation that private settlements with injured patients are more cost-effective in the long run that negative publicity from young patients being hospitalized or treated in local emergency rooms,” the report suggested. They conclude by recommending that Missouri’s laws related to the abortion industry concerning inspections, medical malpractice, transparency, and whistleblower protections be strengthened by the Legislature. “We commend the Sanctity of Life Committee on their work and pray it will lead to true reforms within Missouri that will protect women from exploitation and danger at Planned Parenthood while saving as many innocent children as possible from a brutal death by abortion,” said Newman.